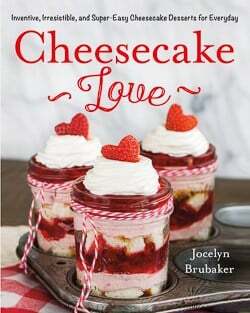 *I am so excited to share that my Cheesecake Love cookbook is available for preorder now! We are completely in the middle of spring madness. The weather here in west Texas has been up and down for the past few weeks. I’m definitely enjoying the high temp days more than the low days. Today happens to be dreary and cold as I am writing this, and it makes me sad and sluggish. Thank goodness tomorrow will be sunny and in the high 70’s. With all this warmer weather our family has been outside a little more. This past weekend we bought some outdoor paint and painted the shed in our backyard. Ok, so I say “we” painted, but I just picked out the colors, and my husband did most of the work. That’s helping right? We also put in another little flower bed to the side of the shed. So far, my black thumbs have managed to keep both flower beds alive. We also took two old pallets from behind the shed and white washed them. The plan is to make fun leaning flower beds for under the shed windows. That will probably happen this weekend in between soccer games. 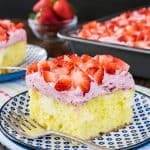 Warm weather and flower beds have me in total spring dessert mode in the kitchen as well. I have been breaking out the lemon and lime and fresh fruit this week. 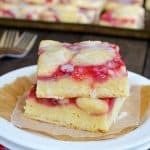 Since tomorrow will be sunny and bright I’m even thinking about making another pan of the best lemon bars to celebrate. My goal this month has been to use up some of the extra baking ingredients I have accumulated in our pantry. Let’s not talk about what a hot mess that room is right now! I reached in and grabbed a strawberry cake mix that has been hanging out since last month. It was supposed to become cookies, but I just never got around to making those. Thank goodness because I am in love with how this trifle turned out. 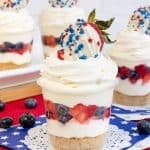 Trifles and parfaits are one of those desserts that are so easy to make, yet they look like you spent forever making them. 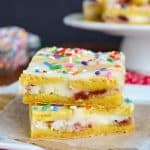 A few years ago I made this pina colada cake trifle, and it has been one of my favorite desserts every since. I wanted to create something similar, but totally different. 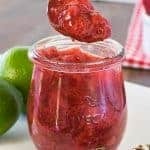 Enter in the strawberries! Like I said, this dessert is super easy to put together. Just bake the cake in a 9×13 pan like normal. Let it cool and then cut it into 1 inch cubes. 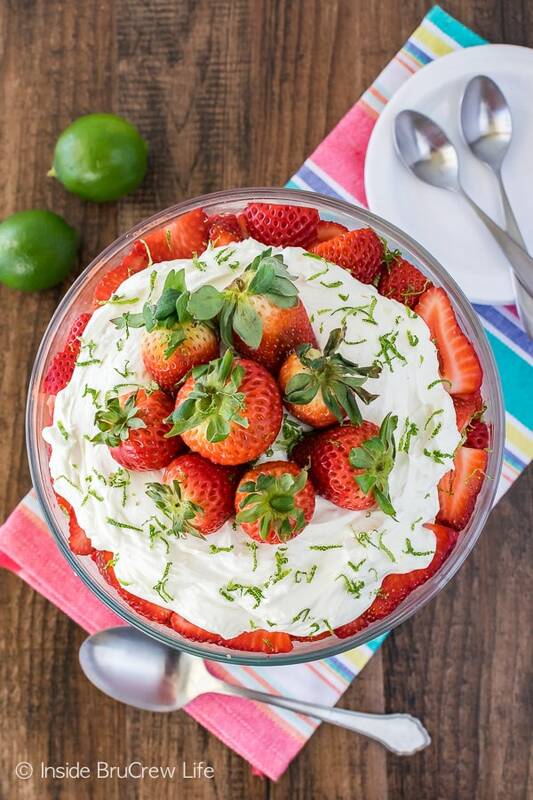 The cheesecake layer is just a mixture of cream cheese, sugar, key lime juice, and Cool Whip all mixed together. 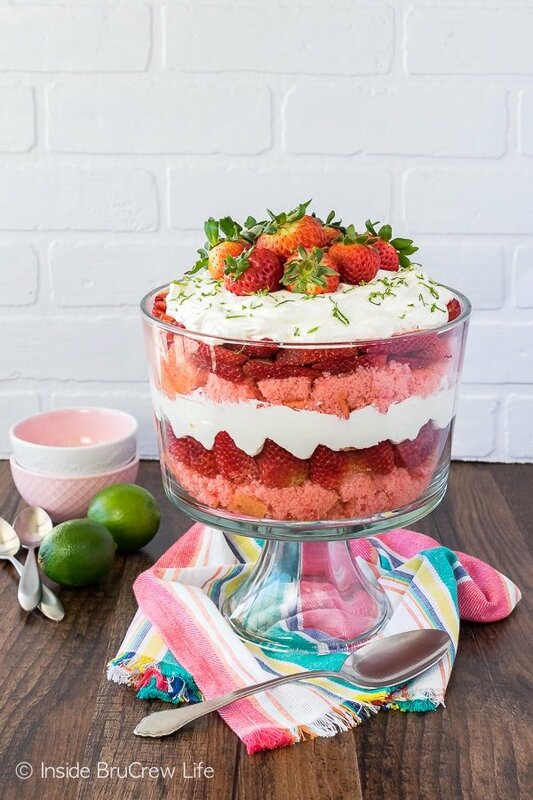 Then all you have to do is slice up a big box of strawberries, and you are ready to layer everything together. See what I mean? Easy, peasy lemon squeezy! Or in this case lime! 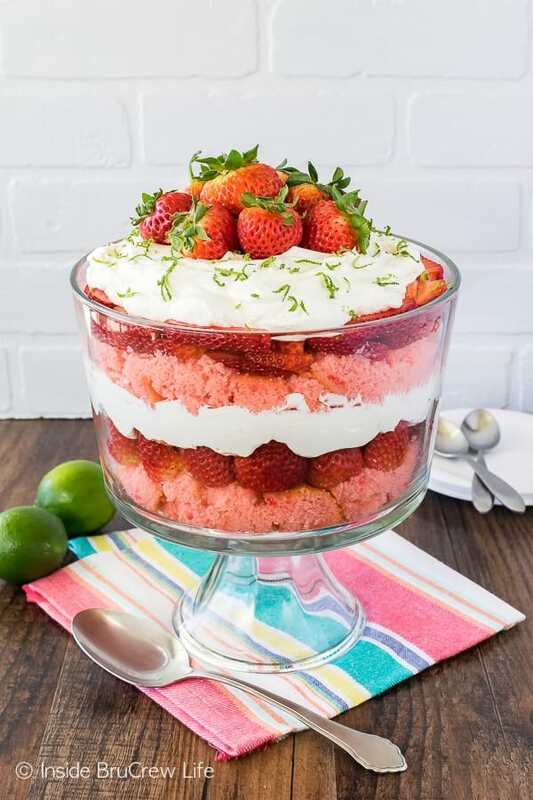 I actually had every intention of using lemon when I first came up with the idea for this strawberry key lime cheesecake trifle. But as I was rummaging in the fridge for the lemon juice, I grabbed the key lime instead! It was the best change of plans for sure! 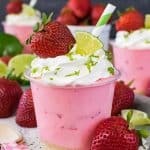 Some of my blog friends have strawberry and lime on their minds as well. You have to check out these Homemade Strawberry Cupcakes. I love that swirl of pink frosting on top! 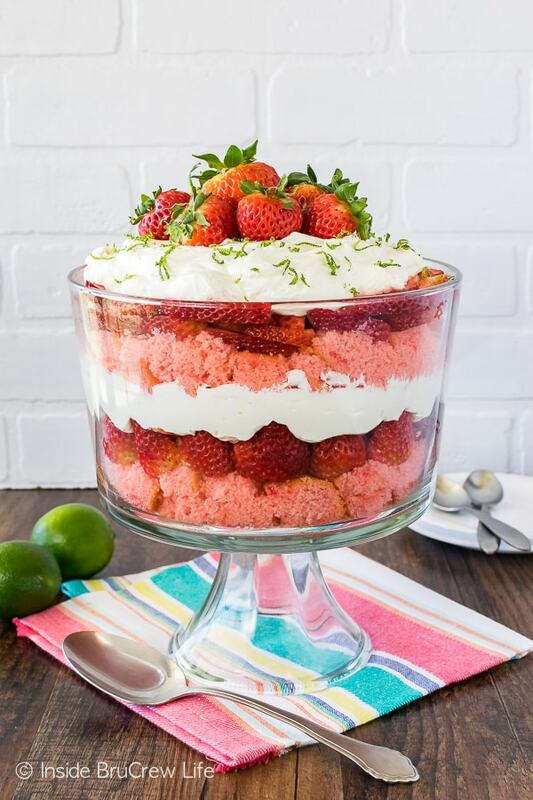 And this Strawberry Punch Bowl Cake totally has my name on it. Dessert layers in a bowl are so fun to make! And how good does this Tequila Key Lime Bundt Cake sound? I’m a big fan of big bundts!!!!! Preheat the oven to 350 degrees. Spray a 9x13 pan with nonstick baking spray. Beat the cream cheese and sugar until creamy. Add the lime juice and beat again until smooth and creamy. Fold in the Cool Whip. Layer 1/2 the cake cubes, 1/2 the cheesecake, and 1/2 the strawberries in a large trifle bowl. Repeat the layers ending with the cheesecake on top. 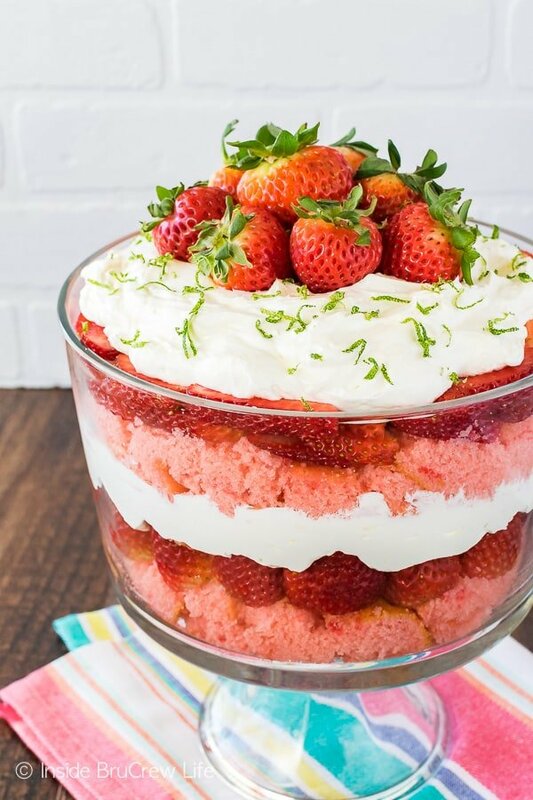 Garnish with whole strawberries and lime zest. * This post contains affiliate links. 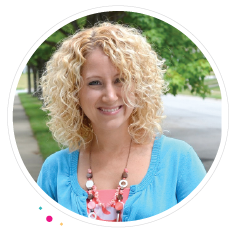 Inside BruCrew Life may receive a very small percentage from these free referral links. As always, these do not cost you any extra. Thank you for letting us share products we use and love.